“Wow! She can’t say anything, but she can sing it!” Such words are very common among the caretakers and family of individuals with Alzheimer’s disease (AD) and other memory care diagnoses. Many have seen the powerful effects of music to elicit verbal output from those who are otherwise unresponsive. Even if they have not heard the song for years, even decades, their memories associated with music remain intact. When one thinks of Alzheimer’s disease (AD), the first symptom that comes to mind is progressive memory loss, but this is just one of the symptoms that accompanies the disease. Over time with deterioration of structures in the brain, language deficits begin to manifest, such as when having difficulty naming people or objects, speaking fluently, comprehending speech, and deteriorating in the ability to produce spontaneous speech (Dassa, 2014, p. 132). The result is often a communication divide between the person with AD and their family, friends and caretakers. They are unable to express themselves clearly, to understand others clearly, and to maintain a sense of time and context. Hence, it is not surprising that four of the common areas of concern for people with AD are agitation, anxiety, aggression, and apathy, also known as “the four A’s”. Combined with the lack of inhibition caused by neural deterioration, the four A’s are understandable symptoms exacerbated by social isolation. In this study conducted in Israel with individuals with AD, Dassa (2014) reports on one of the many ways that music can overcome the barriers to communication and self-expression that AD presents. Music is a unique back-route to nearly every part of the brain. Musical activity stimulates nearly every region and neural subsystem (p. 134). Thus, while pathways for language abilities generally undergo more damage, the “roads” necessary for music skills and prosodic (melodic) aspects of language remain intact. Hence, a person with severe dementia may be able to sing a song perfectly whilst they are only able to produce inflected strings of “empty speech” -- words or babble that convey little meaning to the listener (p. 132). Music is incredibly valuable for improving quality of life for people with AD. It is their bridge to communication in several ways. Music is a mnemonic device with melody, harmony and rhythm assisting in the recall of lyrical information, preserving their ability to sing strings of language content. 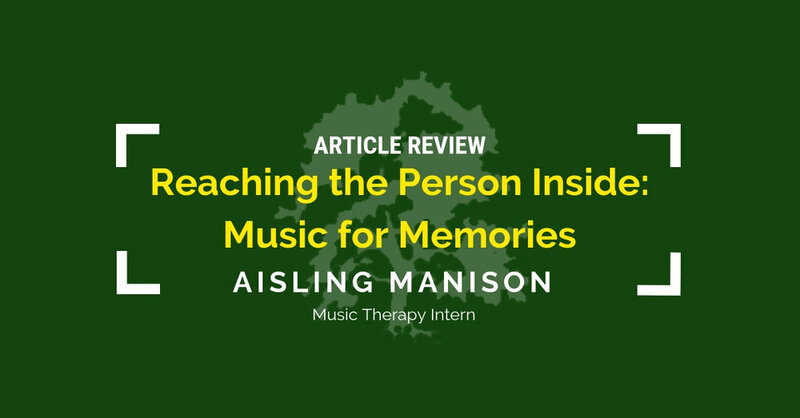 Songs also often have strong associations with memories and can provide the person with AD access to mood, memories and thoughts (p. 133). Additionally, music can ground people with AD emotionally. It reinforces their sense of belonging as they sing familiar songs with those around them and provides an escape from social isolation and distress (p. 134). It enables them to finally engage with the world outside! Such group singing and reminiscing has been found to reduce symptoms of depression. Participants even encouraged each other and made comments on how to improve the quality of their singing. One said, “I think we stop too much, we have to sing more.” In essence, these comments indicated that singing promoted their sense of well-being, self-esteem, and belonging. Dassa reports how the conversation topics were closely related to each song’s content and musical features. It appears that lyrics communicated specific ideas while the music cued emotions. For example, songs that triggered memories related to social gatherings had a triple meter that evoked the feeling of togetherness, such as around a campfire while swaying and singing. I work a great deal with people receiving memory care services, and I foresee to do much more work with them in the future. In my experience in my internship, people with Alzheimer’s often have a lot to say about their history once they are appropriately prepared. Dassa’s study reveals the importance of song selection and musical characteristics. I often think about the physiological effects of musical elements in my song selections, such as the tempo or instrumental texture, but categories of songs can also affect what types of memories are elicited. When selecting repertoire to use with my clients, I have to ask myself, “When and where would they have heard this song? What memory could it be related to? What emotions do the musical elements evoke?” For example, swing and dance music might be associated with memories of social events, such as when going out with friends or with a date. The musical elements may make them want to dance, which will also aid in the recall of such autobiographical memories. Additionally, Dassa’s questions when analyzing the songs begin very specific to the content of the lyrics, such as “What type of flowers in the garden are mentioned in the song?” These not only have clear, concrete answers, but also check accuracy of language output and begin to stimulate deeper thought on the lyrics which may in turn trigger memories. In addition to asking my typical open-ended questions about their autobiographical experiences, I would like to try this approach to song discussion with my clients in the future. Perhaps drawing closer attention to the familiar lyrics will improve their ability to share their stories. The greatest joy comes from helping a person with AD to connect with the world around them. When I hear comments such as the ones mentioned above, it is heartwarming to see that the person inside is still there and still able to find a sense of self and delight through song. Dassa, A., and Amir, D. (2014). The role of singing familiar songs in encouraging conversation among people with middle to late stage Alzheimer’s disease. Journal of Music Therapy, 51(2), 131-153.